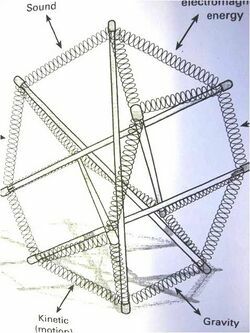 Read here about tensegrity structures composed of six struts, part of a series of pages organized by strut count. 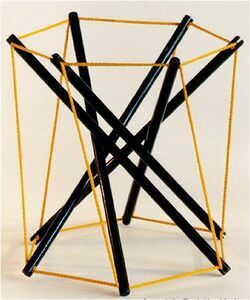 The 6 strut tensegrity is considered by many as the most essential tensegrity. 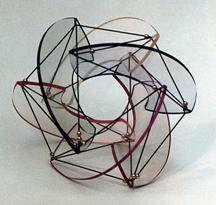 The most common 6 strut tensegrity outlines a icosahedron. The outline is not obvious, as in many constructions some of the icosahedron edges are inferred. 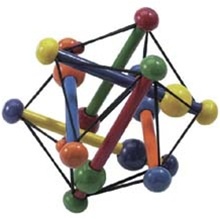 It may be more accurate to say that the 6 strut outlines the jitterbug in its icosahedron phase. Based on 6 struts, the tendons can outline a stellated doedahedron. 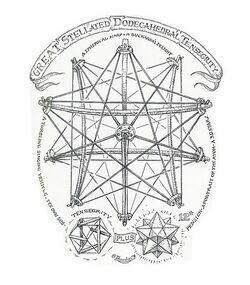 6 strut tensegrity, Great Stellated Dodecahedral Tensegrity. Drawing by MonteThrasher. de Jong comments: the 6 strut structure is "neutral" as compared with the 3-strut tensegrity modules that is "charged" due to its chirality. WIth the 3-strut, one must connect two charged tensegrites together in opposition to make a neutral one. Tomaiwa flexes and compresses the model while discussing it in Japanese. [[media type="youtube" key="OGEdQOaHyVY?fs=1" height="385" Image width="480"
Links: Tomaiwa's channel, http://www.youtube.com/user/tomaiwa. Tomaiwa made a similar video holding a 3 strut prism, see 3 struts. 6 Strut tensegrity rendered with springs as tension tendons. Skwish 6 strut tensegrity, designed by Tom Flemons, sold by Manhattan Toys. 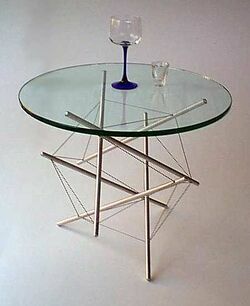 Koenig coffee table, glass top on a 6 strut tensegrity base. 6 curved struts with nuclear object. The original Skwish by Manhattan Toys, designed by Tom Flemons. 6 strut prism, black struts with yellow twine tendons. 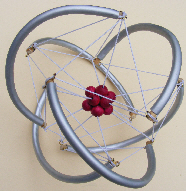 6 curved strut tensegrity with membranes on the 6 leaves. 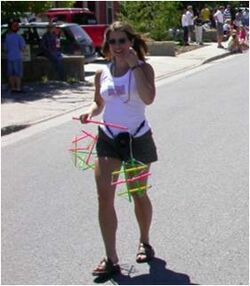 Woman on parade holding a mobile, from which two 6 strut tensegrity structures hang. This page was last edited on 25 September 2018, at 09:38.